We realize that “Intuitive” sounds ridiculous when used to describe an MSP Platform, but we’re serious. It’s intuitive. 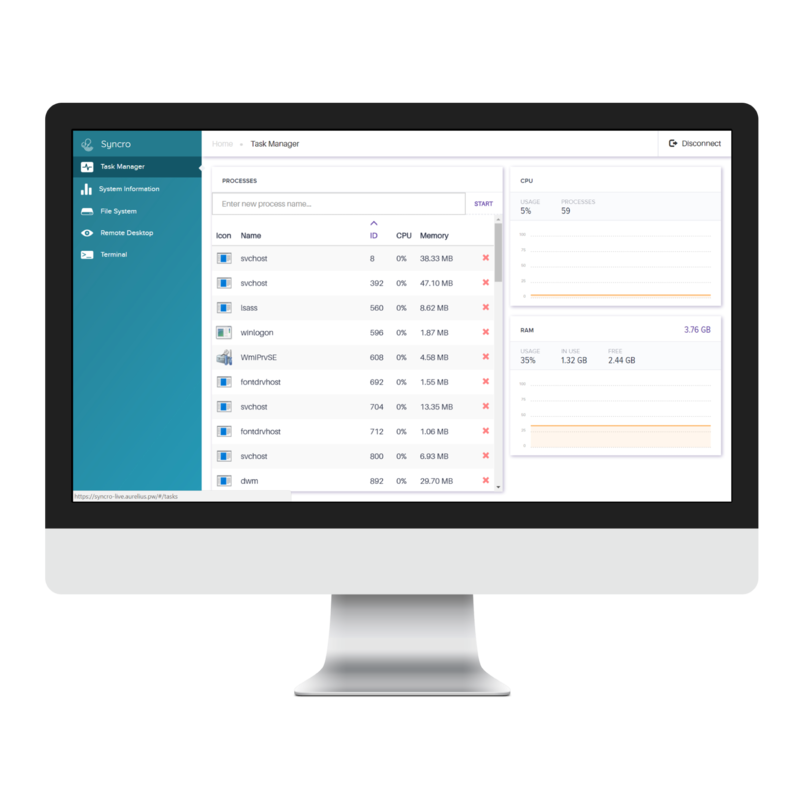 With Syncro, your PSA and RMM work together seamlessly, you can easily launch a Remote Session, and all of your data lives in a centralized MSP Dashboard. Syncro is built to truly streamline your workflow. Syncro integrates with your favorite apps – like ScreenConnect, IT Glue, TeamViewer, Bitdefender, Quickbooks and more – so you can eliminate the double data entry and re-invest that precious time into your business. Just pay per seat and get unlimited endpoints with clear visibility to any optional add-ons. Not much more to say here. It’s really that simple! Our goal: to build MSP software you’ll love to use, with an intuitive interface that makes you more efficient and cuts down on training time. No Contracts. No Minimums. No Platform Fee. No Setup Fee. No Required Training Fee. Just Transparent and Fair Pricing. Come see for yourself. Create an account today and try Syncro free for 30 days. From Contract and SLA Management to integrated Ticketing, Customer Relationship Management, and end-to-end Billing, Syncro’s full-featured PSA embraces automation to streamline your day-to-day workflow. 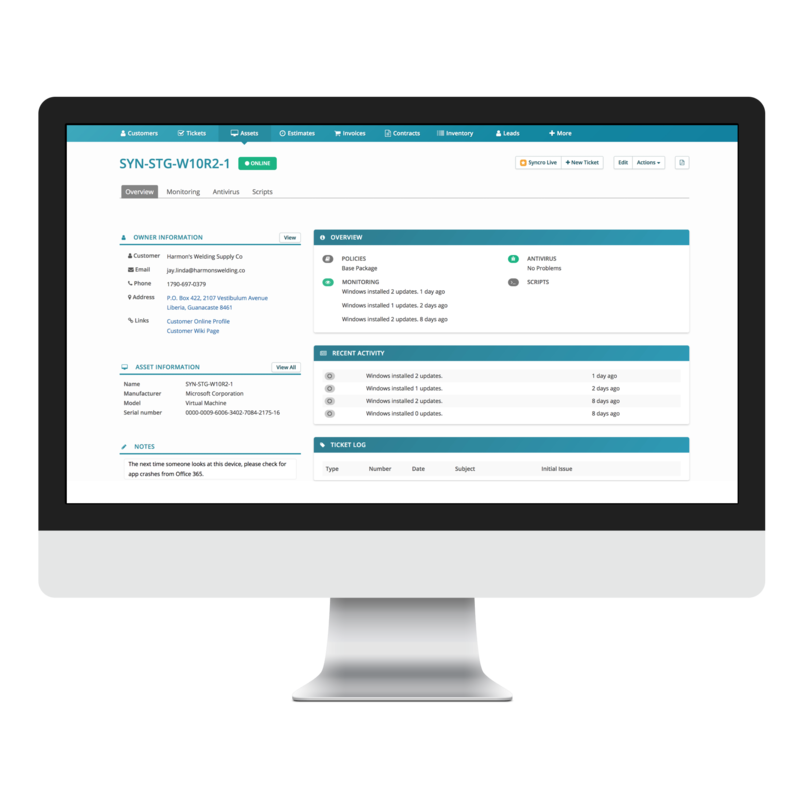 Asset Management, real-time Monitoring and customizable Notifications, MSP-centric Reports and tons more live harmoniously with your PSA in Syncro. Say goodbye to double data entry and back-and-forth platform syncing, and say hello to a truly all-in-one MSP platform. Instantly launch Remote Sessions to take control of client’s machines and diagnose issues faster with Syncro’s built-in Remote Session software. Start sessions with one-click directly from Assets for a truly all-in-one experience. Create an account today to claim your 30-Day Free Trial of Syncro and experience the power of a truly integrated MSP platform.